Last week, I shared a few photos that I took while travelling around Banff National Park, Canada, and I am truly humbled by the number of wonderful comments that were submitted, so I decided to show you a few more. Over the past week, Mother Nature decided to bless us with 30 inches of snow, which has everyone in town talking about one thing: skiing! November is an exciting time of year for local residents of Banff. The hustle and bustle of the summer tourism season has come and gone, traffic and parking are easy to find. The local ski resorts start teasing us with photos and potential start dates for the upcoming ski season. A fresh crop of Aussies are running around town in their “jumpers” looking to get all the necessary gear that is required for an extended ski holiday in Canada. It truly is an exciting time of year! It’s at this time of year that I look through old ski and snowboard photos and get myself psyched up for the coming season. Here are a few that I hope you will enjoy seeing as much as I did taking them. 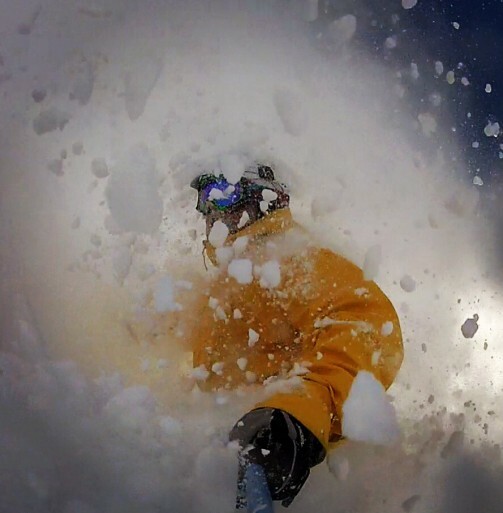 They say that there’s “no friends on a powder day” and this photo is living proof. I’ve lost sight of all my friends in a cloud of snow. 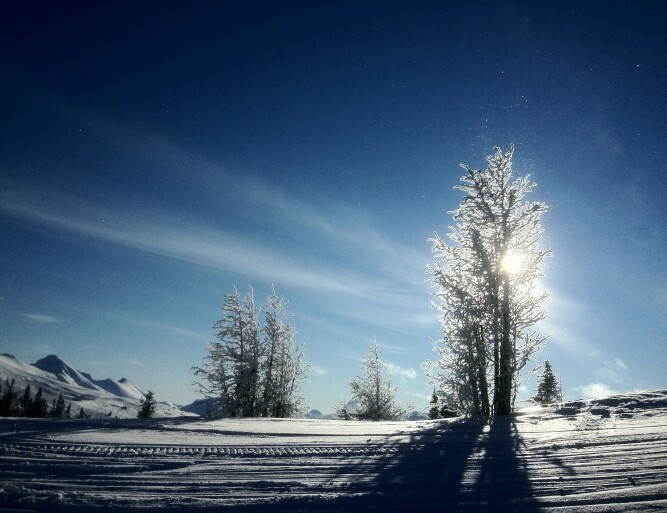 Sunshine Village Ski Resort offers some incredible backcountry access to Banff National Park. This area is known as “Back Door” and is a favourite among locals. Will you be hitting the slopes this year? Where are you favorite ski destinations? This entry was posted in Alberta, Canada, Travel and tagged adventure, Alberta, Banff, bucket list, Bucket List Publications, bucketlist, Canada, landscape, skiiing, snow, travel, Travel Photography, Winter by lesleycarter. Bookmark the permalink. Wow! I used to live in Calgary, and loved Banff, but I have not seen it from the ski slopes…. I haven’t seen it from the slopes either. I think I’ll have to add it to the list. Kevin’s photos have inspired me. 🙂 Do you ski? Yes, I ski, but it’s been years since I did downhill, I do more cross-country:) But, I do love Canada (I am from Norway), and there is more on my bucket list to see there…..
And Norway is on my list. I have been a few months in Montreal, I just love it. I have also visited Toronto, because my husband lived there for a while. Where are you from? Growing up in Florida, I didn’t see snow till I was almost 17. Now in the Pacific Northwest, I hope each year a bit of the rain will treat us by turning white and sticking on the ground for a couple days . I’ve skied a little in WA at Mt Baker but got really spoiled in France at a little place in Belle Plagne- just up the hill from La Plagne. It’s a beautiful ski in ski out lodge with your lockers under the apartments. It was a little more affordable a few years back when we lived in Paris and was located just 200km outside of Lyon. It was what I imagined places like Banff or Aspen being (but have never been to either). I will always be a blue run skier but love the thrill those medium skilled slopes provide. It was also a great family place to park and stay a week in this enclosed community that provided all your needs. I’ve always wanted to learn cross country. I would love to ski at Mt. Baker someday. I hear the amount of snow that they get is ridiculous! Where else have you skied? I’m always searching for new resorts to visit. Oh and got so caught up in my memories I forgot to say these are some killer photos! Kevin these are great photos of the beloved powder days here in the Rockies. We spent many days out on the slopes when our son was ski racing. I remember a day at Sunshine when it was minus 30 Celsius! However most of my memories are blissful days such as these. Beautifully captured! I’ve always wanted to try ski racing but haven’t had the opportunity. I enjoy laying down some trenches on my GS skis (almost) as much as face shots and powder turns. What discipline did your son compete in? That sure is a beautiful part of the world that you are living in. Meanwhile, here in recession-hit Ireland, we are engulfed in Autumn gloom, of nature’s – and mankind’s – making. Thanks for posting! We are heading to Banff fomr the UK in nect summer.. ..hope the snow has cleared by then!!! I remember skiing around Banff, Alberta many moons ago and being just amazed at how beautiful it was! Awesome pictures and great post! Dolomites; in Italy? I’m not very knowledgeable of great ski areas but I’d like to change that. I’m thinking about adding a few of the best places to my 2014 list so I’m open to great suggestions. Amazing shots! Holy cow! 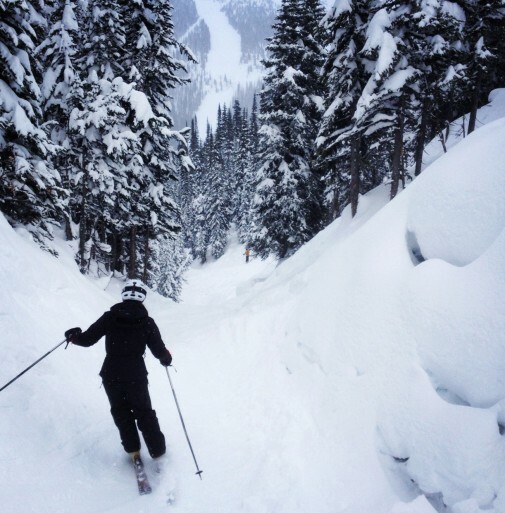 Never have I wanted to hit Banff more…but for cocoa and picture taking – this girl hasn’t skied (or wanted to) in twelve years. Wicked pictures! I gotta get out to the mountains! What time of photography do you specialize in? Do you have a website? No problem Kevin. I shoot weddings and real estate. You can see some of my stuff at http://www.robmoses.com, http://www.RealEstatePhotos4U.com and http://www.robmosesphotography.com ;). Do you have another website? Well jealous. Now that’s what I call a winter scene. Wish we got snow like that in Ireland. No snow at all for past couple of winters, but the previous two we got loads, so here’s hoping for this year! Forgot to mention your pictures are great! I don’t ski but sure enjoyed looking at those beautiful pictures. I enjoyed the last pictures you took and you have a really good eye for detail. Just amazing! It’s been so wonderful being able to connect with different people, regardless of their interests, through my photographs. What type of activities do you enjoy? I’m always interested in trying new things! Thanks Kevin. I enjoy long walks and love fishing although don’t do that in the winter. These pictures are amazing! I absolutely love the one of your friend on the snowboard! I won’t be able to ski this year due to a knee injury, but maybe I’ll be able to fit some snow tubing in. Even though I won’t be able to ski or snowboard this year, I’m still excited for the season! My friend was also very excited when he saw this photo. He sent a copy home (Australia) to make all of his friends jealous. There is another ski resort in Banff called Mt. Norquay that has a snow tubing park. It is a ton of fun! Aaahh snow makes the world an amazing wonderland as these picture prove. Divine pictures. Beautiful country and stunning photos. Banff and Lake Louise are beautiful any time of year! Wow truly stunning!…Wish I was there. Amazing photos, can’t wait to see it for myself! Oh, I like the contribution from a new writer! These photos are awesome, hope to get on the hill soon…definitely have the itch! Writing my first post was a bit nerve-wracking, but i’m glad that I did it. 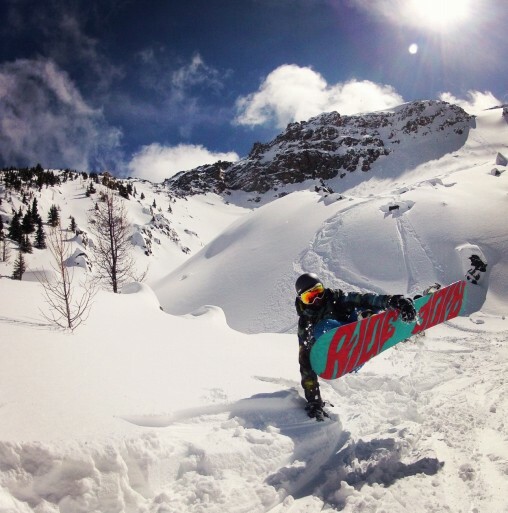 Where do you like to ski/snowboard? I use to live in Mammoth Lakes (California) so that has a special place in my heart but anywhere there is snow works for me! I have been to Banff but it was years ago and a bad winter, there wasn’t much snow that year so I would like to go back at some point. The post came out well. You had fun with it! No way, I was in Banff last week too, and it was freezing man. Such a beautiful place though! I’ll be there in late Jan for 2.5 weeks! I can’t wait. Thanks for sharing these photos they are what I need to stop me from going insane as I wait for my holiday!! What activities are you considering during your vacation? Maybe I can provide some insight. I have a friend who’s a tailgunner at Baldface and he likes to tell me that his “office” looks exactly like the incredible photos you’ve posted. I’m just a little green (or white?) with envy….! I am also envious of your friend’s “office”. He has one of those jobs that most people can only dream of!! Beautiful….I never experienced Winter or snow for that matter. I live in a tropical country…but one of my greatest desires is to have a “white Christmas”…one day soon i will be there.. you just inspired me more…way to go..
Those are beautiful winter photos and you’re blessed if you get to spend the season in Banff! Not sure if I’ll make it this year, but we’re having a really gorgeous winter up here in Edmonton already! Amazing Photos! They just make me want to get back to snow again. I spent last Christmas snowboarding in Japan and just fell in love with it all!!! If I was to make a winter Bucket List, Japan would be one of my top 3 choices. I spent a season in Lake Louise and its photos like these that really make me miss the place!!! We rarely had snow like that but when it puked it puked!!! Holy fazzoli this is a gorgeous picture!!!! The very first one is stunning!!! And the last one is so peaceful yet action filled simultaneously. They are just superb!! !